Tuscany is such an extraordinary and varied land of Italy, and with so many different sights and attractions spread all across its territory, that one gets continuously surprised by new hidden corners. Even for people living here like me, Tuscany is a continuous discovery. Beyond the most touristic Tuscan destinations, such as major art towns and Tuscany popular medieval hill villages like Volterra or San Gimignano, there’s much more to discover. There’s also a lesser known and unusual part of Tuscany, equally fascinating and incredibly amazing; made of tiny hamlets and picturesque villages rich in history, old traditions, peculiar crafts, ancient walls, lovely alleys and stunning landscapes. Uncommon places, that right for this, are extraordinary and have the great pleasure of new unexpected discoveries. Here you can find new unconventional routes in Tuscany through small medieval and Renaissance villages remained intact all over the centuries, which preserve the charm of narrow streets and alleyways winding through enchanting historic buildings. Rising on a panoramic hill in the beautiful countryside of Arezzo, Anghiari is a real gem of Tuscany! Its small historic center, made of stepped alleyways, gives it an incredibly suggestive atmosphere, not to mention its fine views. During the famous battle of Anghiari, in the year 1440, the Florentines defeated the Milanese army of Filippo Maria Visconti. The Battle of Anghiari was the subject of one of the most famous and discussed lost masterpieces of Leonardo da Vinci, the Renaissance fresco that should be hidden in Florence’s Palazzo Vecchio, behind the fresco by Giorgio Vasari. 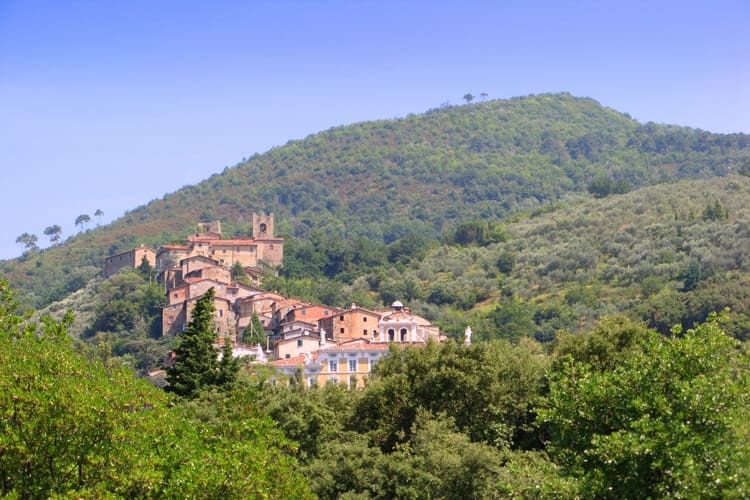 Collodi is a lovely and peculiar small hill town east of Lucca. Its name soon brings to mind Pinocchio, the famous children’s book by Carlo Lorenzini, alias Carlo Collodi, that used the pen name of Collodi in honour of this small village, birthplace of his mother. The Parco di Pinocchio is dedicated to this famous tale, it’s very interesting, especially if you have children. Villa Gargonzi, located at the bottom of the town, that scenically develops vertically on the mountain’s slope, is impressive! not to mention his beautiful and magnificent garden. Maybe the most characteristic and ancient hill town in Chianti, Montefioralle seems to get out of a painting, with its stone houses standing side by side, its little balconies adorned with flowers and its medieval walls. A fine Chianti wine is produced in the area. This wonderful thermal village in the province of Siena is surrounded by a beautiful scenic countryside; all green hills, cypress trees, and lush forests. Its town center is typically medieval with a twist of narrow alleys and lovely squares. San Casciano dei Bagni is one of the best thermal destination in Tuscany, do go for the Fonteverde Tuscan Resort & Spa for a super stay in a unique environment! Murlo is an extremely appealing tiny medieval hill town south of Siena, its ring of houses forms thick walls, enclosing the town center with the town hall and the church. Its Etruscan Museum is not to be missed. Santa Fiora is a peculiar l village on the Monte Amiata, south of Siena. The Aldobrandeschi clock tower facing Piazza Garibaldi is lovely, as is the square. Particularly impressive is the Peschiera – fishpond, rising around the springs of the river Fiora and surrounded by a wall with a wonderful garden surrounded by woodlands and brooks. It was commissioned by the Sforza family in the sixteenth century. Certaldo is a striking medieval hill-top town in the heart of the Elsa valley, with red-brick towers, palaces and battlements and enjoying enchanting views over San Gimignano and its towers. Certaldo is known for its connection with the famous Tuscan writer Boccaccio; here you can visit the house where he spent the last years of his life. Set in the beautiful province of Arezzo dominating the Casentino valley, Poppi is a very tiny village and one of the most stunning hill towns of Tuscany. Poppi is dominated by the Castle dei Conti Guidi, impressive castle with a beautifully frescoed chapel. The landscape surrounding the village is of exceptional beauty. Rising south of Siena near the Monte Amiata, Radicofani is a small charming hamlet dominated by a spectacular medieval fortress. The panorama from the top of the rocca is something that takes your breath away! During the Middle Ages the fortress also had its Italian Robin Hood! Though more famous and well known than the previous destinations, Pitigliano is often left out from the common tour of Tuscany, also due to its location at the far end of Tuscany on the border with Lazio. Pitigliano, also known as the little Jerusalem, is a real treasure of Tuscany, an exceptional and unique sight! It rises from the rocks and seems to be suspended up in the air. Its houses seem to be part of the rock itself and its town center is exceptionally astonishing! Narrow streets, arches, Etruscan tombs, wells, and cellars. The green landscape surrounding the village is then fabulous! Sorano, Sovana, and Pitigliano are known as the Città del Tufo, as they are carved into the tuff stone in a unique territory with countless remains of ancient civilizations, such as the Etruscan necropolis along the Vie Cave. Thank you very much for investing so much enthusiasm (and time!) in sharing information on lesser-known / less-visited places in Tuscany. Allen in the U.S.
I’m happy you like my post. I was lucky enough to have spent a month in the hill town of Anghiari! Not enough adjectives to describe my tiime there. If anyone is thinking about visiting Tuscany this town should be considered!! You’re so right! Anghiari is a very beautiful and suggestive town. If you like to tell more about your holiday on Tuscany, do not hesitate to come back here and see your story published in this special section of the blog. We are looking for an intact village with train acces to Florence. Thank you for your advice.